The D610 full-frame DSLR improves on last year's D600, while costing $100 less. The D610 looks and feels about the same as its D600 predecessor, but with a number of significant tweaks. While some shooters may be disappointed that the new camera does not offer GPS or Wi-Fi, the D610 is nonetheless slated to be Nikon's most affordable small format full frame camera for photographers stepping up to a full frame DSLR. It's targeted to the same audience as the D600--enthusiasts, advanced shooters, and semi pros who understand photography, love the photographic process, and recognize the advantages of a full frame sensor for depth-of-field control, wide dynamic range, superior image quality, low noise, color fidelity, and low-light performance. 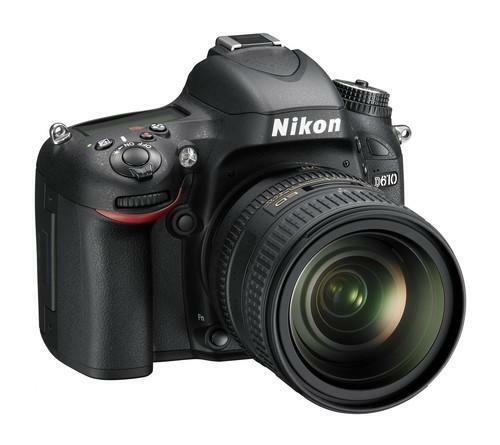 Because it has a full frame sensor, the D610 works with Nikon's FX format lenses. An auto or manually adjusted crop mode also accommodates the use of Nikon's DX lenses, which are designed for use with smaller APS-C sensor models. The D610 and D600 share some significant features, such as a 24.3-megapixel FX-format CMOS sensor (full frame, 35.9 x 24mm), Nikon's Expeed 3 image processing engine, the 39-point contrast-detection autofocus system, and full HD video at 24, 25, and 30 fps (720p at 25, 30, 50, and 60 fps). The 39-point autofocus system is compatible to f/8, so someone using a telephoto lens with a teleconverter will not have any issues with autofocus in low light. The pop-up flash has a built-in commander mode so you can trigger off-camera Nikon Speedlight flash units wirelessly. In addition to an eye-level optical viewfinder, there is a 3.2-inch, 921,000-dot fixed LCD. The D610 offers some improvements over the previous model, too. For example, an updated Auto White Balance algorithm lets users capture more vivid skies and offers more natural reproduction of artificial light and more natural skin tones, according to Nikon. A new shutter mechanism affords faster continuous shooting of 6 fps as opposed to 5.5 fps in the previous model. The D610 features a new Quiet Continuous Shutter Mode which, when selected in the main command dial, lets users shoot quietly at up to 3 fps at times when silence is golden--such as for weddings, wildlife, or sleeping babies. The Nikon D610's weather sealing is dust and moisture resistant, while the top and rear covers are made of magnesium alloy, similar to the Nikon D800. Nikon has already acknowledged issues with spots appearing on the D600 sensor, and camera forums have exploded with discussion about flaws in at least some of the previously released D600 cameras. Buyers familiar with the issue believe that the D610 is essentially a re-release of the earlier model featuring modest improvements, but with the flaws fixed. To that, Nikon told TechHive, "The Nikon D610 is a successor to the D600 and ... is more advanced than the D600, offering improved camera performance, high-speed continuous shooting at approximately 6 fps, a new quiet continuous (Qc) shutter-release mode as well as improved auto white balance for even more impressive image quality. Because the occurrence of dust is common due to the structure of digital SLRs, we constantly strive to reduce this in every product we introduce, including the new Nikon D610." The camera (body only) will be available in late October for $2000, a price drop of $100 from the D600. A D610 kit with an AF-S Nikkor 24-85mm f/3.5-4.5 lens will sell for $2600.